Last updated: Jun 11, 2017. 18:41 +0100. There has been a long running saga about whether Page Speed is a ranking factor. First they said it was, then they said it wasn’t, then they said it will be. Well, we now have confirmation that page is a ranking factor for the mobile search results, but it only penalizes really slow pages. We recommend using Lighthouse to test your page speed, which can be accessesd either via the Chrome developer tools, or via the web.dev website. Will making your web pages load faster improve your Google rankings? Mobile Page Speed Update only affects slowest sites, but they can incrementally improve. John Mueller, Google Webmaster Trends Analyst (Jan 24, 2017). To clarify on the mobile speed update: a) this only affects the slowest sites, b) those can incrementally improve (though ideally you’d significantly improve the speed…), c) we’re still aiming for this month. If your site is reasonably fast, tweaking won’t change things. Google Webmaster Blog (July 9, 2018). Google has confirmed that they are now using page speed in mobile search rankings. THey confirm that the “Google speed update” will only onpact your Google ranking on pages that deliver the slowest of experiences to users, and it will only affect a small number of queries. As of November 14, 2018, it would seem that PageSpeed Insights now uses Lighthouse for their calculations. We recommend using Lighthouse which is available in the Chrome developer tools, or at web.dev. Page Speed will be a ranking factor with the Mobile First Index. Gary Illyes, Google Webmaster Trends Analyst (Gary Illyes) (March 22, 2017). Page speed / mobile first: reinventing concept of page speed, bc the desktop page speed Google used won’t work for mobile. During the SMX Mobile First session, Gary Illyes discussed page speed and how they will be incorporating it into the algorithm when the Mobile First index is introduced later this year. Google is poised to make further announcements as the introduction of the Mobile First index gets nearer. There is currently no load time limit, but you should aim for <2-3 secs. John Mueller, Google Webmaster Trends Analyst (Nov 26, 2016). On the 26th November 2016 John Mueller gave some concrete advice on what your target page speed should be. Just looking at the two most recent comments by John Mueller, it is arguable whether the ranking factor even exists anymore. It has even been suggested by some that if your website is too slow, the crawlers will not even index it. Mobile Speed may become Ranking Factor. John Mueller, Google Webmaster Trends Analyst (May 12, 2016). Page speed will probably become part of the mobile friendly signal group. With the mobile-first indexing update coming soon, it would make sense to link any page speed algorithms to the mobile version. Page Speed is not a ranking factor, but really slow sites may be penalized. John Mueller, Google Webmaster Trends Analyst (Apr 21, 2015). I don’t know how much of that is still used at the moment. So we do say we have a small factor in there for pages that are really slow to load where we take that into account. But I don’t know how much that’s actually still a problem in ranking. I don’t know how much of that is still used at the moment. So we do say we have a small factor in there for pages that are really slow to load where we take that into account. But I don’t know how much that’s actually still actually still a problem in ranking. It clearly indicates that there is no positive ranking factor for fast loading websites, but that they may penalize very slow websites by a very small amount. Billy Hoffman \ Moz \ Zoompf (Aug 1, 2013). A set of speed vs ranking tests carried out by Billy Hoffman in a post on Moz dated August 1, 2013. He was helped by Moz Data Scientist Matt Peters, and Zoompf. Hoffman tested over 40 different page metrics for 100,000 different web pages, so as you can appreciate, the scale of this test was significant. The full data from this test can be downloaded here. According to Hoffman, while they tested over 40 different metrics, the majority of them had no influence on the rankings. One example given, was that the number of connections a web browser uses to load the page had no relevance. They tested both the “document complete” time and “fully rendered” time. They found no correlation between the complete load time of the webpage and rankings. 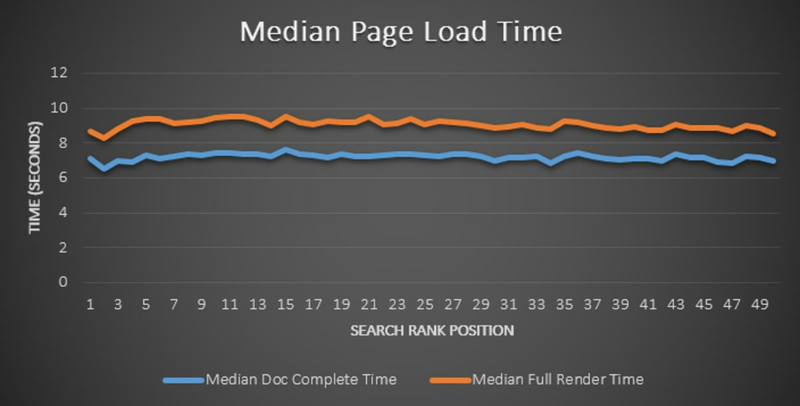 Page load time Google ranking. © Moz. As we have mentioned a few times in this article, they then measured the Time to First Byte, or initial response time for the browser to receive the initial response from the server. Remarkably, this did show a very small correlation. Time for first byte ranking factor. © Moz. The results make perfect sense. 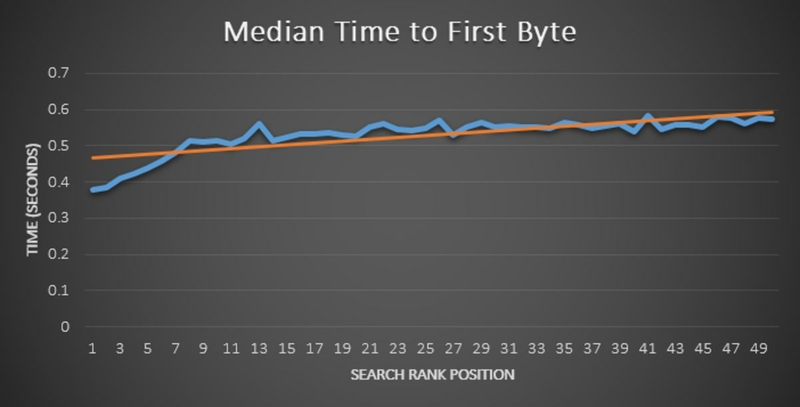 Time to First Byte is the easiest, and simplest metric for Google to capture, as it can be done by their existing crawlers. The network latency between a visitor and the server — You can improve this by choosing a web server close to your visitors, or using something like CloudFlare Page Rules to cache your content and serve it close to your visitors. How heavily loaded the web server is — This is easy. Just choose a great web hosting provider. How quickly the website’s back end can generate the content — This can be solved with page caching. Check out our W3 Total Cache & CloudFlare tutorial to gain significant speed improvements. Not all experts agree that Time to First Byte is a useful metric. Just take CloudFlare, whose performance optimization focuses more on the experience received by end users, rather than a specific metric. As you will read later, maybe Google representatives agree with this statement. Matt Cutts, Head of Webspam, Google (April 9, 2010). Matt Cutts discusses the motives behind why site speed is a ranking factor. I would love if SEOs dive into improving website speed, because (unlike a few facets of SEO) decreasing the latency of a website is something that is easily measurable and controllable. The specific mention of latency further enforces that they are not measuring the total load time on the page, but instead the time taken for the initial response. First, this is actually a relatively small-impact change, so you don’t need to panic. Second, speeding up your website is a great thing to do in general. Visitors to your website will be happier (and might convert more or use your website more), and a faster web will be better for all. Third, this change highlights that there are very constructive things that can directly improve your website’s user experience. Google made the formal announcement that website speed influences rankings. As part of that effort, today we’re including a new signal in our search ranking algorithms: website speed. Website speed reflects how quickly a website responds to web requests. The terminology used here is quite interesting. They could have said “the time the website takes to load”, but they chose the wording carefully to indicate the response to the request. We suspect from this that they may just be recording the time to first byte, i.e. the time it takes for your browser to start receiving information from the server after first making the request from the browser. This would make sense as it would be something their web crawler could easily measure at scale. We revisit this point further in the next section. In the original post, Google quoted internal studies confirming research that shows that when a website responds slowly, visitors will spend less time on it. In addition, faster websites can reduce operating costs. They state that they use a variety of sources to determine the speed of a website relative to other websites, and then list some free tools that can be used to evaluate website speed. You can view our detailed and more up to date post on measuring the speed of a website here. In that post we also discover why speed test results should not be interpreted too literally, as some measures to speed up your website can create false negative flags on some of these tools. Matt Cutts, Head of Webspam, Google (Mar 14, 2010). By far, the vast majority of websites are in the first realm, where PageRank plus other factors determines how deep we’ll go within a website. It is possible that host load can impact a website as well, however. So, if you have a slow website, you may find less pages are crawled, and this may reduce the amount of content Google picks up from your website, and affect rankings that way. But this is pushing the boundaries of the discussion a little. Matt Cutts, Head of Webspam, Google (Nov 13, 2009). A lot of people within Google think that the web should be fast. It should be a good experience and so it’s sort of fair to say if you’re a fast website maybe you should get a little bit of a bonus or if you have an awfully slow website maybe users don’t want that as much. While the official announcement post didn’t arrive until a few months later, Matt Cutts started hinting and explaining the reasons why a faster website may rank higher in the SERPs. We are starting to think more and more about should speed be a factor in Google’s Rankings. Because even in Adwords if your website is slow that can be a factor in how much you have to pay in Adwords. Historically we haven’t used it in our search rankings but a lot of people within Google think that the web should be fast. It should be a good experience and so it’s sort of fair to say if you’re a fast website maybe you should get a little bit of a bonus or if you have an awfully slow website maybe users don’t want that as much. This is quite interesting as it is one of the few comments made by Google or their representatives that indicate a positive ranking boost for the faster websites, rather than just a decrease in ranking for the very slow ones. Since we’re hearing a lot of talk about the implications of Page Speed, I wonder if Google still cares as much about relevancy? Or are the recentness and page load time more important? Now, relevancy is the most important. If you have two websites that are equally relevant same back links, everything else is the same, you’d probably prefer the one that’s a little bit faster. So Page Speed can, in theory, be an interesting idea to try out for a factoring and scoring different websites. But absolutely, relevance is the primary component and we have over 200 signals in our scoring to try to return the most relevant, the most useful, the most accurate search results that we can find. So, that’s not going to change. Our philosophy will always try to be “Try to return the best page to users.” Try to give them information about what they typed in. But if you can speed your website up, it’s really good for users as well as, potentially down the road, being good for search engines. So, it’s something that people within Google have thought about. Wouldn’t it be great if we could find a way where websites that are especially fast, or websites that are really, really, really bad experience for users. It would be only one of over 200 different factors, but still could be a small factor in saying, “Yeah, you know what? This person’s worked hard to deliver a really good user experience in addition to be in relevant.” So, let’s show that to users. What do we mean by Website Speed? Website speed is the time taken for your website to load in the browser. Google uses data from the Chrome User Experience Report to measure performance data about website. Certain Chrome users allow usesrs to report back load time metrics to Google, with a current dataset enjoyed by Google already covering the top 1 million origins. In early 2018, John Mueller at SMX confirmed that the PageSpeed Insights Tool now includes data from the Chrome User Experience Report. Recently however, Google has been promoting Lighthouse, an open-source, automated tool for improving the quality of web pages. The PageSpeed Insights Tool now uses Lighthouse to assess page speed. You can access Lighthouse in Chrome by pressing F12, and then going to the “Audits” tab, and running an audit. Alternatively, a new website has been launched allowing you to run Lighthouse within the browser. You can find the new website at web.dev.